Police said Kennedy's car swerved before it crashed into a barricade on Capitol Hill. WASHINGTON (CNN) -- U.S. Rep. Patrick Kennedy said Friday that he will enter a rehabilitation program after crashing his car on Capitol Hill a day earlier. "I know that I need help," the Rhode Island Democrat said at an afternoon press conference, detailing what he called a long-term struggle with depression and addiction. He said he would be traveling Friday afternoon to Minnesota to seek help at the Mayo Clinic, where he was treated during the congressional recess at Christmas for an addiction to prescription pain medication. He said he returned "reinvigorated and healthy." Kennedy, 39, said he had no recollection of the events surrounding the crash into a barricade on Capitol Hill early Thursday morning. He said in a statement Thursday evening that he was apparently disoriented at the time of the crash after taking the prescribed amounts of a sleep aid and an anti-nausea drug. "I am deeply concerned about my reaction to the medication and my lack of knowledge of the accident that evening. But I do know enough to know that I need to seek expert help," he said Friday. "I hope that my openness today and in the past, and my acknowledgement that I need help, will give others the courage to get help if they need it," he said. Asked as he left the room if he planned to resign, the six-term congressman responded, "I need to stay in the fight." Kennedy's father, Sen. Ted Kennedy, said Friday he has "enormous respect for the work Patrick has done." "All of us in the family admire his courage in speaking publicly about very personal issues and fully support his decision to seek treatment," the Massachusetts Democrat said. "He has taken full responsibility for events that occurred." The Capitol Police statement said an investigation of the crash was still under way. "Upon review, it has been determined that in the initial stages supervisors employed improper judgment," it said. "Corrective administrative and personnel action has been taken. The Capitol Police remain committed to impartial and fair enforcement of laws and impartial and fair treatment of all citizens." A congressional source who was briefed by police told CNN the watch commander on duty early Thursday has been reassigned for allowing two sergeants to drive Kennedy home soon after the crash, while ordering two officers at the scene to return to duty. Police labor union officials said earlier that officers were told not to give Kennedy a sobriety test after the mishap. Kennedy said Thursday police drove him home afterward but that he did not "ask for any special consideration." Asked if he thought he got preferential treatment, Kennedy said, "That's up for the police to decide, and I'm going to cooperate fully with them." The police incident report includes an observation that Kennedy appeared to have been drinking and his ability was impaired. "At no time before the incident did I consume any alcohol," Kennedy said in a statement Thursday. Greg Baird, acting chairman of the U.S. Capitol Police union, has called for an inquiry into how the incident was handled. Capitol Police said Friday they were also looking into whether the evidence supports traffic charges against Kennedy. The incident report said Kennedy was cited for three infractions -- failure to keep a proper lane, unreasonable speed and failure to give full time and attention to the operation of a vehicle. According to the report, Sgt. Kenneth Weaver said he saw Kennedy's vehicle -- a green Ford Mustang convertible -- "traveling at a high rate of speed in a construction zone and also swerving into the wrong lane of travel" with its lights off. Weaver said Kennedy's vehicle hit a curb and swerved back into the wrong lane. He said he was driving east and used "evasive maneuvers in order to avoid a collision" with Kennedy's car. The officer said he turned around and pursued Kennedy, whose car did not stop but did slow, "finally stopping after colliding head-on with a vehicle barrier." The report said when Weaver approached Kennedy he noticed his "eyes were red and watery, speech was slightly slurred, and upon exiting his vehicle, his balance was unsure." "I think he was extended a courtesy by virtue of his position," said Lou Cannon, president of the local Fraternal Order of Police chapter. Cannon was not at the scene of the crash. In his Thursday evening statement, Kennedy said he had returned home after final votes in the House of Representatives around midnight Wednesday and taken the sleep aid Ambien and an anti-nausea drug. The lawmaker identified that drug as Phenergan, "which in addition to treating gastroenteritis, I now know can cause drowsiness and sedation." In his comments Friday, Kennedy said, "The recurrence of an addiction problem can be triggered by things that happen in every day life, such as taking a common treatment for a stomach flu. "That's not an excuse for what happened Wednesday evening, but it is a reality of fighting a chronic condition for which I'm taking full responsibility," he said. 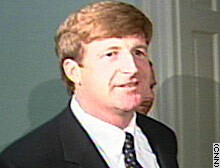 Kennedy was involved in a separate car crash in a pharmacy parking lot in Rhode Island three weeks earlier.